On May 2, 2014 Jacqui and Dan Saldana lost their 3-year-old son, Ryan. Although I never met him, a piece of my heart broke off when he died. I learned about Ryan, while he still graced the planet, from my niece Molly. On May 2, 2014 Jacqui and Dan Saldana lost their 3-year-old son, Ryan. Although I never met him, a piece of my heart broke off when he died. I learned about Ryan, while he still graced the planet, from my niece Molly. For a time, she worked with his mother at the Madewell store in Santa Monica, California. I began reading Jacqui's blog, Baby Boy Bakery where she shared recipes and the adventures of being Ryan's mom. His adorableness, wrapped in red curls, was irresistible. Last May, Ryan was struck and killed by a truck while playing outside of his cousin's home in Alta Loma. An unfathomable loss that no parent should ever have to face, Ryan's death sparked a social media outpouring of love and support for his family. The well wishes were posted with the hashtag #RedBalloonsForRyan, which was begun by family friends. 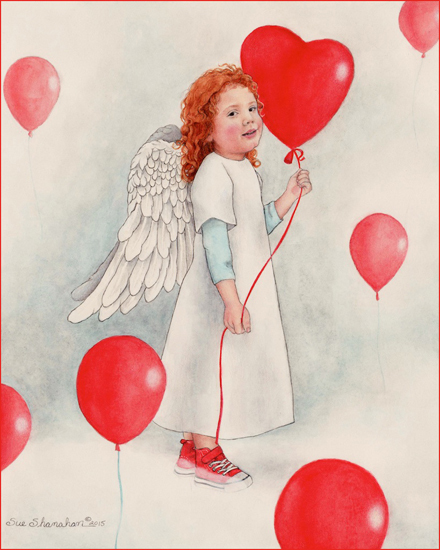 Red balloons were chosen as a symbol for Ryan because he loved red and balloons. His parents planned to release them heavenward during their little boy's funeral service. Since that time, Jacqui has shared her journey of healing and hope on her blog and Instagram. After learning about what the Saldana's where going through last December, Ellen Degeneres had Jacqui on her show to help get them through the holidays. The talk show host told Jacqui,"I know what you've lost is something you can't ever explain or imagine. Know that you are helping a lot of people with your blog. Continue writing your blog and continue knowing I'm sending you love all the time." After seeing Jacqui on The Ellen Degeneres Show, I felt inspired to send her love in a tangible way. What if I did a watercolor of Ryan as a gift for his parents? But as hard as I tried, I couldn't get in touch with them. Still I felt called to do it. The whisperings of Ryan urged me on. Why not paint his portrait anyway? I could have it published with an essay about the anniversary of his death. I knew somehow it would get to Jacqui and Dan. When a parent loses a child, their greatest fear is that the world will move on and forget about their son or daughter. I wanted to make sure they knew that wasn't going to happen to Ryan Cruz Saldana. So today, you are seeing and reading my remembrance of Jacqui and Dan's little angel. Believe me when I say I didn't create this alone. I will be your "little man" forever.